Amazon.com description: Product Description: Although it requires no technical background and absolutely no mathematics, The Internet Book explains computer networking and the Internet. In addition to covering the most well-known applications such as the World Wide Web and electronic commerce, the book describes how underlying technologies -- such as cable modems -- are used to deliver Internet services. Everyone can understand this book because all technical details are explained using analogies to everyday life. If you want to understand the Internet, but do not have a strong background in science or engineering, this book is for you. About: Although it requires no technical background and absolutely no mathematics, The Internet Book explains computer networking and the Internet. 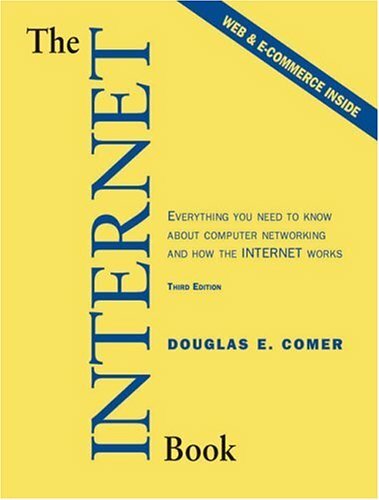 About: This revision of a bestseller is ideal as either an introductory Internet textbook that assumes no technical background or as a highly accurate, clearly written, very understandable professional overview of Internet/Networking technology and applications; written by leading Internet authority, teacher researcher, Doug Comer.